Does anyone know the interior measurements of the P228 magwell? I need to know the difference between the p229 .40 & the older p228/p229 9mm. 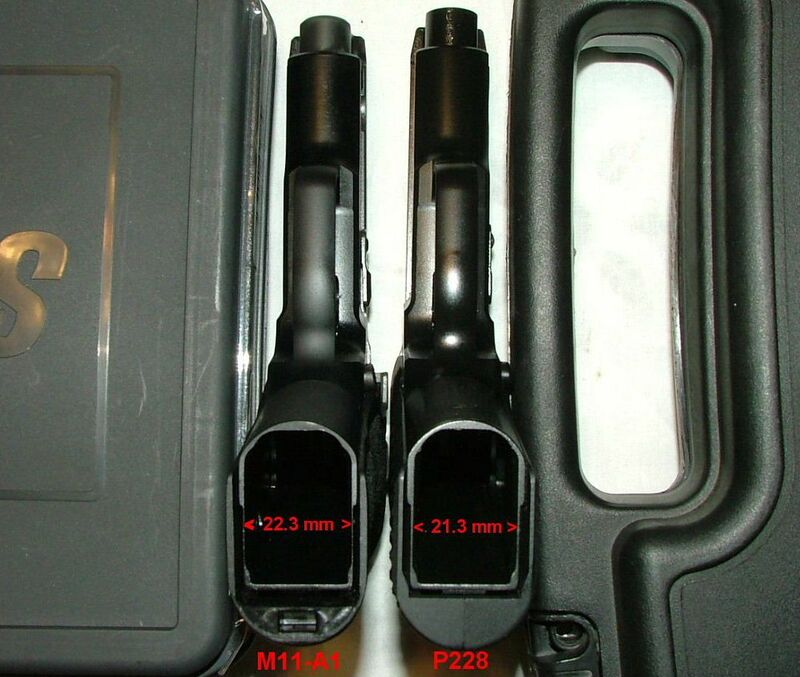 I don't do .40, but these measurements I did a while ago comparing the M11-A1 to the P228 will do. The M11-A1 is really a P229 (9), which uses the same frame as the P229 (.40/.357). I've always wondered if the difference in width went the entire length of the magazine well or was just at the opening. Q are you able to do that measurement? Logic dictates that the mag well has to be wider at least halfway up. Whether the rest of the way is wider is irrelevant. I was thinking the opposite, that the P228 magazine well was also wide and that just the opening was narrow. My post was about the 229-1 (M11-A1) mag well, which makes sense. You're wondering whether the P228 magwell is narrow at bottom (opening) and wider inside? Makes no sense at all to me. What's the point? Maybe I'm dense. My understanding/recollection is that the P228 and early P229 9mm magazines are just shortened P226 magazines and the magazine well is shaped to accommodate them. For whatever reason, Sig made the magazines (and magazine wells) wider on the P229 in .40S&W and .357Sig, but did not change the frame or magazine dimensions on the P226 in those calibers. Eventually, as a cost cutting measure, Sig went to just the .40/.357 frame for 9mm as well, and the 229-1 9mm magazine came along which better fits that frame. Interestingly, when looking at Mec-Gar 10 round 9mm magazines for the P226 and the P228 side by side, the tube, follower, and spring are identical. The only difference is that the plastic plug on the bottom is a little longer on the P226 magazine. No, I think the problem is my wording. I'll try again. The external dimensions of the P228 and P229 grip frames are the same. So I was wondering if the internal dimensions (specifically the width) are also the same (wide) and that the only difference is the opening being wider on the P229 than the P228, if that makes sense. I started to wonder when I looked at my P228 and thought the wall of the magwell opening looked thicker than the walls of the grip frame. Slosig, I believe the .40/.357 P229 mags were made wider strictly for capacity. The P226, because it has longer grips, using basically the same mag get 12 rounds of .40/.357 from a 15rd 9mm mag. If SIG did the same with the 13rd P228/P229 9mm mag they would probably only get 9 or 10 rounds so they widened the bottom in order to get 12 rounds. Okay, took my P228 out of the holster, unloaded, and locked open. Got my P229R out of the safe, checked clear, and locked open. Started measuring carefully with strong cheaters (reading glasses) and the nearest tape measure, which reads to 1/32". Measuring the outside just in front of the the grips (too lazy to go grab an Allen wrench to take the grips off the P229R), they are indeed the same on the outside. Looking very carefully and measuring the flat, straight inside part, not the bevel, I get 1/32" less than 7/8", or 27/32" for the inside measurement of the P228. Doing the same on the P229R, I get 1/32" more than 7/8", or 29/32". WTF, how? Looking closer, I see that the P228 has more of a bevel, while the P229R has the barest hint of a bevel. The only conclusion I can draw is that they made the P229/40 frame 1/32" thinner on each side to sneak in the extra capacity without changing the outside of the frame and requiring different stocks. Both frames appear to be straight on the inside and there is no step where it is smaller at the bottom and more open higher up on the P228. Right, I understood why they made the P229 .40/.357 mags wider. I just wondered why they didn't do the same for the P226, as more boolits is better, right? Maybe with the longer grip portion of the frame on the P226 they were concerned about thinning the frame and maintaining structural integrity, or maybe another round or two when they were already at 12 wasn't worth the hassle. slosig, thanks for making the effort to take the measurements. I guess I need to re-examine the opening on my P228 more closely as I thought it had a kind of lip that was a little thicker than the grip wall. I always used to think part of the answer was in the fact that the P229's magazine width didn't end up serving solely for capacity. When you think about it, during the Clinton era, the wider P229 magazine could hold 10 rounds of 40 or 357. But it holds 12 rounds of 9mm comfortably (I've tried it, 12 comfortably, and you can force a 13th but it's a bit tight). So its width also made it impossible to insert into a P228 as a way of cheating the ban. But that "theory" that this was by design, goes out the window when you consider that you can do this same thing with a P226 10 round 357/40 mag, and cheat your way into 2 extra rounds using it in a 9mm gun.